Nifty Spot on the weekly charts still very close to the long term resistance 6172 as per 5EMA high-Low Strategy. And currently Nifty is in long term sell mode for the past 4 weeks and requires a closing above 6172 on weekly basis to get into longterm uptrend. 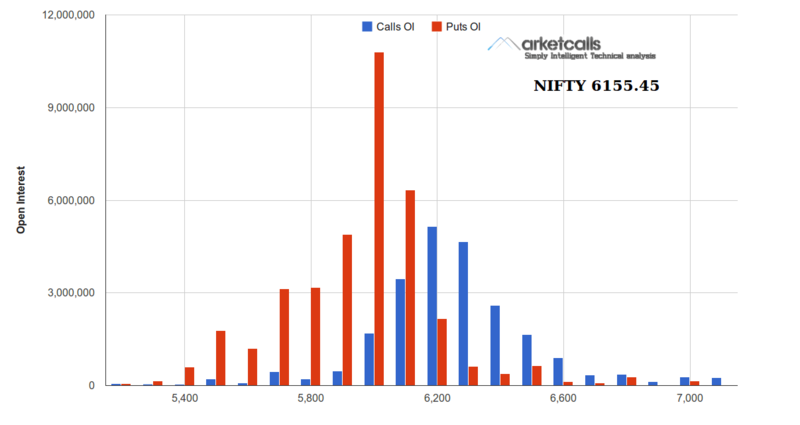 Currently 1.08 crore of Open interest built up in 6000PE strike price this means put writers have a very strong belief that 6000will as a strong support for this option series on EOD basis. So far the open interest built up in most of the call strike prices are not much enough say that call writers are confident at this moment. 6000PE, 6100PE are the put writers hotspot as of now. Declining India VIX in Februrary month suggests that lack of volatility in the Indian Market and so the option writers are quite confident at the 6000PE strike prices. However it is expected that after the Introduction of India VIX Futures volatility in the market could improve a little.